I’ve been working from home for the past year as we continued homeschooling. The hours are flexible enough that I can teach online and also have time to homeschool. I split my time between 3 different online ESL companies. If you’d like to know more about what it’s like to teach ESL online, I have several posts about teaching and why it works great for a homeschool mom. And if you’re interested to know more details about each of the companies I teach for, read on! With each company, I am an independent contractor and I am on contract with the company for either 6 months or a year. For each company you must have fast internet to be able to stream your classes, a webcam, a headset, a working computer, an educational background, and great lighting. 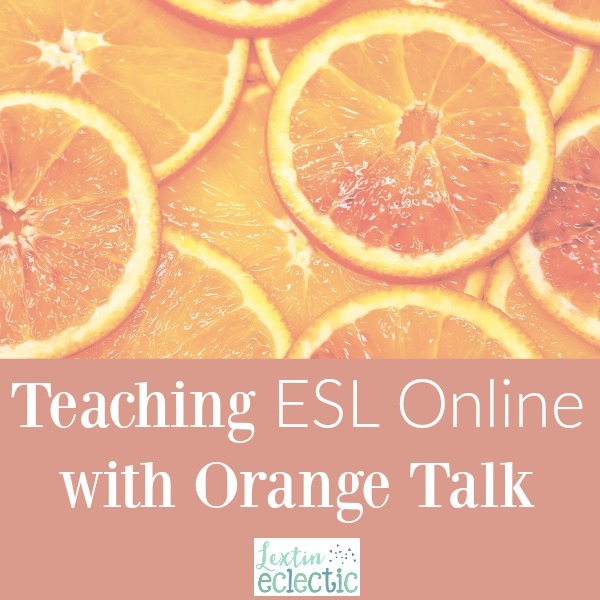 Here’s an overview of Orange Talk ESL! Orange Talk is an online learning program that is used in schools in China. You teach entire classrooms of mostly preschool and kindergarten children. Each class is 25 minutes. The material is prepared for you and you will be teaching with animated PowerPoints that contain songs embedded into them. There is no feedback to provide after each class. The Orange Talk hours are different from many online ESL positions since you are teaching children in schools. Classes are offered 7 days a week but weekdays book better than weekends. They do ask that you set your schedule for one month at a time so classrooms can book with you on a weekly basis. However, they have been flexible with slight schedule changes as long as the office is notified several days in advance. There is no incentive program at this time. Your base pay is what you are guaranteed to make for each class. You will first need to complete your resume on their website. They will contact you to set up a trial class. You will be sent lesson materials to prepare. For your first trial class you will be teaching an adult who pretends to act like a student. You will teach for about 10 minutes and they will provide feedback on your teaching techniques. You will then either be scheduled another trial class with an adult so you can show improvement, or you will be scheduled a trial class with a classroom of children. Once you pass the trial class process, you will be sent a contract to sign. Then you can set your monthly schedule on their website. It seems that Orange Talk schedules most of the classes although I’ve been told the classroom teachers do have a say in choosing their online teacher. I’ve found that bookings were more consistent from the beginning when compared to my other two companies. My time slots have been booked more quickly and consistently with this company. To apply with Orange Talk, be sure to use my referral code and I can help coach you through the hiring process!